There's this wholly irresistible thing going about. Yesterday there were only five or so I knew of, today, KABLOOWEY! Artists are dumping their valuable time to have a go at their Influence Map. The template is here. It is a very interesting exercise to check out your bad self and insightful when nosing at others. Good ones to peep at (cos they have more links to maps than this one) are here and here. I should like to point out I did this while digesting supper so, technically, it didn't take up (much) work time. Secondly, I'd LOVE to point out that of the five or so I saw yesterday, two INCLUDED me in their maps. Totally flippin' mental! But cheered me right up. ALSO Look forward to BL Kardwells map made of booze labels and crisp packets. And NOW it all makes sense! And absolutely none of the artists I thought your work reminded me of when I first saw THE KING'S SHOPPING. Speaking of mignola have you read amazing srew-on head yet? That book is canned inspirado! Of course this was last nights list. 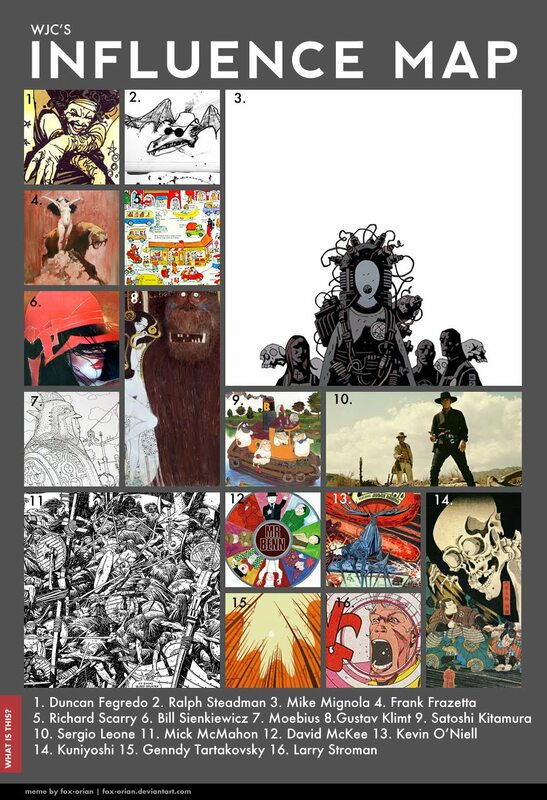 Today's would include Hewlett, Blain, Trondheim, Bernie Wrightson, Joann Sfar, Jim Lawson and on and on. I suppose these are the guys I go back to most regularly to see how it's done. William, not got Screw On Head yet, we're on a spending hiatus but when it's over, it's getting got! McMahon is definitely up there. He is something, still I haven't seen much of his work except a Batman book he did in the nineties. No Guy Davis inspiration? I'm shocked :D Anyway I'll do this test myself because it seems like interesting stuff. Davis ought to be there but I have been nicking the others ideas for longer. Thrilled to see that my mousemat at no.12 has been such an inspiration.